Last weekend marked a tough time for the community of Kitimat, even tougher for those of us down here in Kitamaat Village. I kept a journal of my experience, here it is. Journal entries appear in italics, editorial notes appear afterwards. Note: I had to make a few stops in Kitimat before heading home to the village after work. After I got home, the lights flickered a few times. From living here for so long, I know that’s usually a sign that the power’s about to go out. I was prepared for it to be out for a couple of hours (I stockpile candles, BBQ lighters, matches, flashlights and batteries for just such an occasion) but little did I know what was about to happen this time around. Note: Speaking of batteries, I always have a 9 volt battery in my alarm clock. It operates, but you can’t see the time. I’m not sure why it went off early but I did notice that when the power came back on, it was showing the wrong time. One of the most frustrating things was not knowing what was going on. The only radio station that I was able to get inside my house gave no updates as to what was happening. When I sat in my car, I was able to get CFNR, which I know usually has a news break at the top of every hour, but I still wasn’t hearing anything about what was going on in my area because there were no news breaks. Note: I was trying to conserve my hot water since I had no idea when the power was coming back, which led to my decision not to take a shower that day. Dealing with the hard-packed snow was difficult. I have an edger that I used to break it up but I was only able to break up small parts at a time and it was tiring. Ultimately, it made things easier because I couldn’t get through it with just a shovel. Also, while I was shovelling, I looked up at the trees behind my house and realized I had a friend. 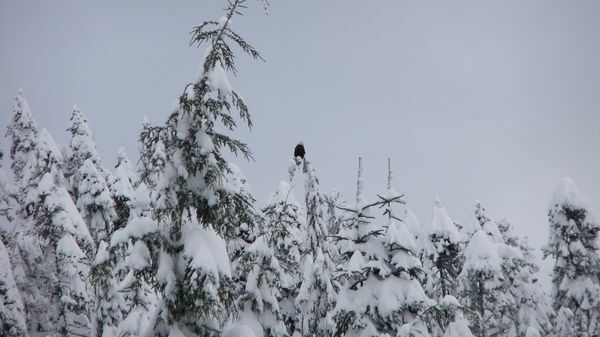 As you can see in the picture, there was an eagle perched on one of the tree tops. He stayed there for quite a while. It was nice to have some company. I started shovelling soon after waking up everyday for three reasons: 1) it was something to do and it needed to be done, 2) I had daylight to work with, and 3) it kept me warm. The problem was, I never had any idea how cold it was outside so I started off dressing as warmly as I could. Then, as I started to shovel, I would warm up and start feeling like I was dressed too heavily which meant I had to keep coming inside to change clothes. I was constantly going in and out of my house, which was disruptive and personally frustrating. Another thing was that I was hanging up my clothes to dry but since it was cold in the house, they weren’t really getting dry. My ski gloves in particular weren’t drying out which was a little gross. 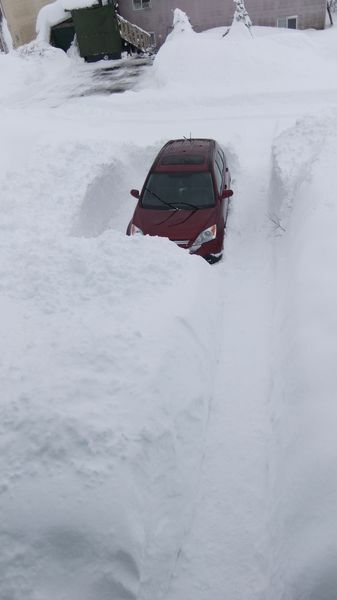 By the time I got all the snow off of my car, I was still blocked in with a wall of snow behind my car. Part of me felt like I should keep going, but I was just too exhausted to do any more shovelling. I figured it would take me about another 2 hours to completely clear all the snow. Below are a couple of pics of my progress. Note: It’s interesting to me that I woke up around the same time the last two days when I didn’t set my alarm. From what I can gather, an evacuation notice went out at about 5:00 am. If so, I never heard about it. Probably because I was sound asleep at that time; but even if I had known, I probably still would’ve stayed home. I had dealt with the situation up until then without much trouble and I really had a feeling we’d have power back soon and I wanted to be home when it did. Also, if I left home, what would I do with my cats? I wasn’t just looking after myself, I had to look after them, too. 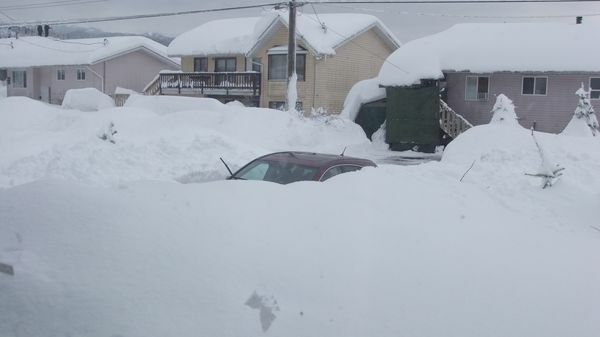 After waking up, I was so relieved to finally have all my shovelling done. I could move my car and, considering that I had garbage building up, it was a good to finally uncover my garbage cans so I could get rid of it all. I honestly didn’t know where my garbage cans were, I just picked a spot and start shovelling. When I heard a “thunk”, I knew I was in the right place. The previous day, one of my relatives told me there was food being served down at the Haisla recreation centre. I meant to go down there that night, but for one thing I couldn’t get my car out of my driveway at that point, and for another thing I’d hurt my knee shovelling so I couldn’t walk down there. I was relieved when the power finally came back on but the lights continued to flicker for a couple of hours afterwards. I didn’t start to relax until I woke up the next morning and found that I still had power. There have been other times when the power went out again shortly after being restored, so I was prepared for the worst. Luckily, that didn’t happen. While that wasn’t the nearly longest I’d gone without heat and hot water, it was the longest I’d gone without power. All of my electronic devices had died and I had no way of recharging them. I found an old Discman that I still had and was able to at least listen to CDs and keep replacing the batteries as they died. See kids, old technology can pay off. Another thing that happened this day was that I remembered I had some bagels stashed away. I cursed myself for not remembering two days before as at this point I was getting tired of eating fruit and chips and it was nice to have something else. Note: The cat pee smell eventually went away. While I had power, I didn’t have internet. I made my Facebook post from my phone in town. Overall, it was a tough situation but it really wasn’t a big deal to me. I spent a lot of time reading and sleeping. Having an idea of what was going on would’ve helped, I was pretty much out of the loop. Like, for example: was anything open in town on Monday? I had no way of knowing other than going over and finding out for myself. Another thing that frustrated me was that I felt like I’d been robbed of my long weekend. I did get the day off work on Friday but I couldn’t have made it out of my driveway if I tried. I didn’t have a choice but to stay home. So when the power eventually came back on, I pretty much had one day to myself and that day was spent cleaning, shopping and getting ready to go back to work the next day. After everything I’d been through, what I wanted was some time to myself to relax. I also can’t help but wonder: why don’t we have our own power supply out here in the village? The power goes at least once a year (sometimes up to half-a-dozen times or more) and it’s usually because of trees falling over due to either snow build-up or high winds, or both combined. The power lines travel 11 km from town to the village with thousands of trees close to them, it’s little wonder that the power goes out so regularly when the lines are so vulnerable. Anyway, this was my experience. It might’ve seemed unbearable to some people, but as I said before, I’ve been forced to live through conditions that were as bad or worse for much longer. It was not much of a problem for me. I don’t think people understand just how determined I can be and how hard I can push myself when I’m challenged. Having said that, I wouldn’t want to do it again.